The March Visiting Teaching gift we've designed for you is one of our favorites! Super sleek and simple, yet so classy with the mint green, gray, and gold color scheme. It includes a card with the message printed on it, and 5 chocolate golden coins - of course packaged just perfectly. 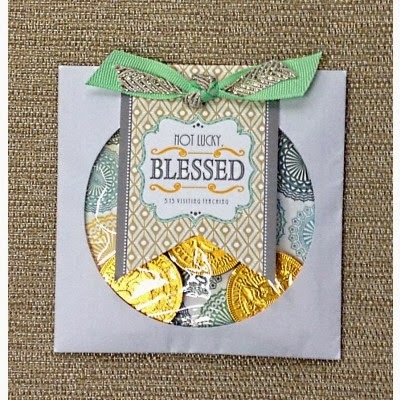 The tag reads, "Not lucky, BLESSED," to remind us all that we are indeed blessed in all aspects of our life. The March Home Teaching gift is sure to bring a smile to your face. The owl shaped card says, "Whoooooo lucky to have the Atonement?" The full message from the March 2015 Ensign is included in a clear pillow box, which is filled with chocolate Rolo candies. Shop online here or in store!